WASHINGTON - Veronica Laguna, 39, came from El Salvador in 2001, after a powerful earthquake devastated her town and left her with nothing. She was granted Temporary Protected Status, or TPS, which has allowed her to live and work legally in the U.S.
Laguna was among the dozens of families who rallied outside of Department of Homeland Security (DHS) offices on Monday evening, part of a week of activities to advocate for an extension of a program that has provided relief to people from 10 countries that have been designated as unsafe due to natural disasters or political conditions. RELATED: Will Central Americans, Haitians 'Protected' by U.S. Be Sent Home? Beyond her family's livelihood, Laguna thinks of TPS as a matter of life and death. “Gangs have taken over so many territories in El Salvador. If I were deported, I would have to take my children. To take them back is to risk them getting killed. I can’t do that to them,” Laguna said. Over 21 delegations from across the country converged in the nation's capital this week to advocate for the program's extension. For many TPS holders, the United States has been home for over 20 years. Sinia Recinos, 42, flew out from Palmdale, California, missing two days of work to urge the Congress and the Department of Homeland Security to take action and ensure President Trump allows for an extension. “My parents brought me here from El Salvador when I was eight years old. It was a scary time. I have lived in this country for nearly 30 years. I now have two children of my own. I don’t know El Salvador, my children have never been,” said Recinos. Mario Flamenco, from Dallas, was very worried about what an end to TPS would mean to his family, since he and his wife come from different countries. “My wife is from Honduras, and I am from El Salvador. We have a 10 year old son. If we were deported my wife would be sent to Honduras, and I would be sent to El Salvador. What would happen to our child? Where would she go?” said Flamenco. Outside of the Department of Homeland Security office, chants could be heard in English, Spanish, and Creole. A large Haitian delegation from Florida chanted in Creole and waved flags with the words “TPS to LPR," from Temporary Protected Status to Legal Permanent Residence. Haitian TPS holders are in a race against the clock, since their TPS will expire in six months. RELATED: Will Central Americans, Haitians ‘Protected’ by U.S. Be Sent Home? In September, Acting DHS Secretary Elaine Duke terminated protections for approximately 1,000 Sudanese immigrants, and renewed the legal status for citizens of South Sudan until May 2019, NBC News reported. On Monday, Sharon Scheidhauer, a spokesperson for U.S. Immigration and Custom Services, said in a statement to NBC News that DHS “will review conditions in each country individually" to determine decisions by the appropriate expiration date. Lys Isma, a Haitian TPS holder and TPS member of the UndocuBlack network, came to the U.S. when she was 9 months old. She worried that there is very little awareness about the immigration program that impacts thousands of people. “Our community is trying to come together, but a lot of our officials are unaware about what is happening on the ground. They don’t know that there are nurses that are telling their patients ‘I might not be here to help you anymore,’”Isma said. Advocates and supporters of TPS cite a recent study by the liberal-leaning Center for American Progress (CAP) that the U.S. could lose $164 billion in GDP over the next 10 years if the program ends for Salvadorans, Hondurans and Haitians. A DHS spokesperson said last week that the program was meant to be temporary, but the government has "created a situation where people have lived in this country for a long time." But with a race against the clock, thousands of TPS holders are hoping the Trump Administration will take into account the roots they have planted on U.S. soil. 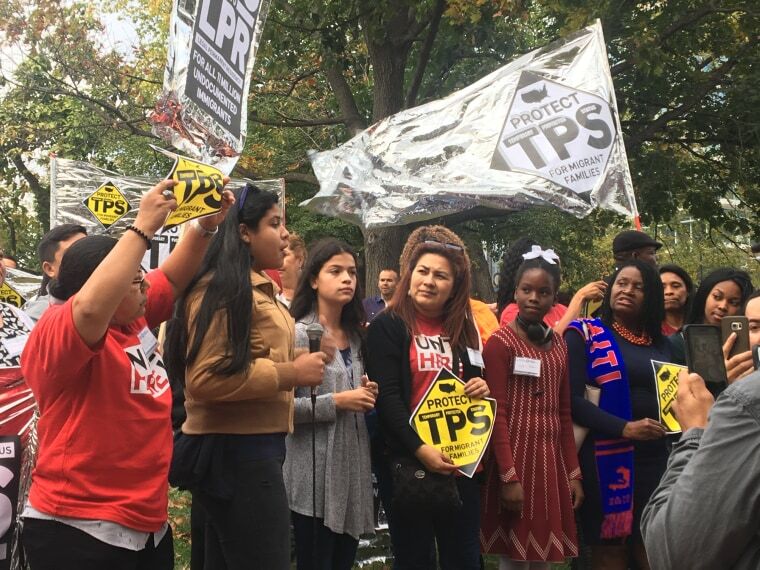 The delegations in Washington D.C., argue that after decades of rigorous background checks, filing fees to DHS and contributions to their community, Congress and the White House should develop a plan to extend their TPS status and expand it to include a pathway toward legal permanent residence.